(May 4, 2017) -- Nearly 400 Roadrunners will receive their class rings this month, joining a growing group of alumni taking part in a time-honored UTSA tradition. Before the rings arrive at UTSA, however, they'll make a special stop. UTSA's class rings are the only graduation keepsake to spend a night in the Alamo. "It's a unique way to tie our students' accomplishments at UTSA to the history of San Antonio," said Steve Woodall, associate director of UTSA Alumni Relations. The UTSA ring ceremony, which began in 2001, is a tradition of its own. 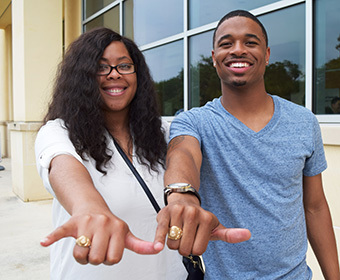 Hundreds of UTSA students and alumni purchase a class ring each semester, marking a milestone in their academic careers and celebration with their families and friends. In 2012, UTSA began placing the rings in the Alamo. Each semester, UTSA alumni staff packs the rings in a secure box and takes them to the historic landmark, where they spend a night before the UTSA Official Ring Ceremony. To date, 4,048 UTSA class rings have been included in this special occasion. "At UTSA, every journey has a beginning and an end," said Jerry Martinez, event services specialist in the UTSA Office of Alumni Programs. "The ring represents the full circle of accomplishments that students have experienced at UTSA." Joyce Fox graduated in 1996 with her bachelor's in anthropology and humanities. This semester, she invested in her class ring, and she looks forward to finally taking part in the ring ceremony. She's hoping her daughter, who enrolls at UTSA in the fall, will take part in the same tradition. "I want to declare my loyalty to UTSA," Fox said. "The ring ceremony is another university tradition that I can cross off my UTSA bucket list." Her boyfriend, Chuck Clark '94, is also getting his ring. "Having a UTSA class ring unites us all," Clark said. "If I'm in a group setting and I see other people with class rings who are fellow Roadrunners, I'll strike up a conversation about their UTSA experience. It unites us and gives us common ground." At the UTSA Official Ring Ceremony, students and alumni will learn about the history and significance of their class ring and receive a certificate stating that the ring stayed in the Alamo. Once the Roadrunners have received their rings, they'll open their boxes together and put their rings on in unison. At Commencement, students who have purchased rings similarly begin the ceremony with their rings facing inward. At the end of the ceremony, they will be called upon to turn their rings around as an outward sign of their membership in the UTSA community. Ring recipients will participate in one of two ceremonies at 6 p.m. and 8 p.m. on Wednesday, May 10 in the H-E-B University Center Ballroom (HUC 1.104) on the UTSA Main Campus. Learn more about the UTSA ring tradition and how to order yours. Watch the UTSA ring journey. Learn more about the UTSA Alumni Association. Wednesday, April 24, 11:00 a.m.
Help our South Texas neighbors by supporting area charitable organizations. Your $6 includes 2 sausage wraps, chips and a drink and helps others less fortunate. Sunday, May 5, 5:30 p.m.
An evening of fine food and drink inspired by UTSA’s renowned Mexican Cookbook Collection. Proceeds from the event will support UTSA’s Mexican Cookbook Collection. The University of Texas at San Antonio is dedicated to the advancement of knowledge through research and discovery, teaching and learning, community engagement and public service. As an institution of access and excellence, UTSA embraces multicultural traditions and serves as a center for intellectual and creative resources as well as a catalyst for socioeconomic development and the commercialization of intellectual property - for Texas,the nation and the world.